The PVA Glue Base coat method has been around for a while now for easy peel-off removal of glitter polish. I personally have been using a watered down version of tacky glue on my nails for the past 6 months and as a result, hardly ever use nail polish remover anymore! 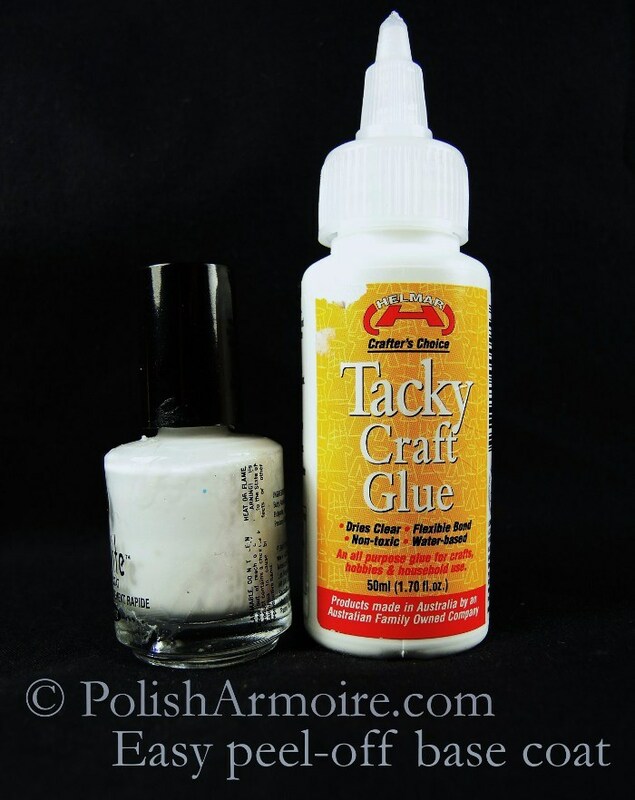 In fact, most of the manis here on Polish Armoire use a glue base coat! I use a glue base coat for non-glitter manis as well because it is so much easier and faster to peel off my polish than having to resort to nail polish remover. I believe that it helps reduce staining too due to the reduced need for polish remover which dissolves polish and causes the polish pigment to directly come into contact with your bare nails. However you still need to put on a coat of your favourite base coat on top of the glue base as the glue base by itself does not prevent staining when applying polish! I thought I’d share some tips and tricks in the hopes that you no longer have to avoid glitter or multi-layer manis due to it being too much of a hassle to remove. I haven’t found an existing detailed guide which covers the extent of my knowledge so I hope you are able to learn something new even if you have read a glue base coat how-to on the web before! What type of glue do I buy? Buy non-toxic tacky glue as opposed to PVA glue. Tacky glue is essentially a more concentrated version of PVA glue and as a result, is a lot more sticky. It should be avaliable where PVA glue is available as it is a type of craft glue. I personally started off using Sullivans Tacky Glue which you can get at the dollar store in New Zealand. I’ve also had good results with Helmar Tacky Craft Glue so I’m not sure if it really matters what brand of tacky glue you use. What do I need to do with the glue? For ease of application, decant the glue into an empty polish bottle so that you can apply it with a nail polish brush. Alternatively you can just dip an existing brush you have into the glue bottle though you may find it a pain having to wash the brush after each use. You will also need to dilute the glue with water for a good consistency that allows for easy application. The more diluted it is, the less sticking power it has. If you dilute it too much or too little, you will not be able to apply the glue in a nice even coat on the nail. Experimentation is required to find the best consistency for application. Only one coat of glue on the bare nail is needed to form a peel-off base for your polish. You must apply the glue onto your bare nail as the polish will not peel off your nails if you apply the glue base over a polish base coat. Be sure to use a normal base coat over the top too once the glue dries to a clear finish! The polish will peel off regardless of whether you apply a thin or thick coat of glue so it is generally best to apply a thinner coat as this will decrease the drying time of the glue base. It is also best to leave a 1-2mm gap at the base and side of your nails when applying the glue base so that the overlaying polish is able to grab onto your bare nail at the edges and seal the glue base in securely. This also makes clean up easier once you have finished your mani as the glue base does not dissolve when subjected to nail polish remover and is a pain to tidy up using hot water! Be sure to also wrap your tips when top coating to further seal in the glue base. How do I remove my polish if it has a glue base coat? Gently remove the polish with either your nails or an orange stick using a peeling motion from base to tip. You can also choose to stick a piece of sticky tape onto the nail and peel it off as this should peel the polish off with the tape. Do not try to force the polish off – if it is difficult to peel, see below for alternative removal methods to avoid damaging your nails. Help! I dinged my wet nails! How can I easily remove the wet polish along with the glue base coat? First take a tissue and dab at the wet polish until you end up with a dry layer of polish. You should then be able to easily peel or roll the whole layer of polish off your nail. Help! The polish on one of my nails just fell off! If the polish fell off in one piece you can glue it back onto your nail with more tacky glue, this has definitely saved my bacon quite a few times! If you find that your polish keeps falling off prematurely, try adding more tacky glue to the bottle to increase the concentration of glue and thus its sticking power. If you have used up all your available tacky glue, simply leave the cap off the bottle for a while to thicken it up. Help! My polish doesn’t peel off easily! If you find that it is too difficult to peel the polish off it probably means that you haven’t diluted the glue enough with water. You can also experiment with moisturising your nails before applying the glue which will make it easier to remove the glue base later on. The safest way to remove hard to peel-off polish is to use polish remover. Get off as much of the polish as you can with the polish remover and a layer of glue will be left behind on the nail – it doesn’t matter if there is still quite a lot of glitter left behind as long as there are portions of the nail that are polish-free. This layer of glue should peel off fairly easily – if it doesn’t, simply run your nails under a tap to hydrate the glue and make it soft before gently rubbing it off your nails along with the glitter – which is still easier than the foil method! For emergency/lazy removal, put on a fresh thick coat of a fast-drying top coat, wait for it to half-dry, then slowly smush the softened coat of polish off your nail from base to tip using either your nails (if they are strong enough and not prone to breakage) or an orange stick. The harder it is to remove the polish, the slower you should go.To prevent accidental tearing of the nail it is best to start from the centre and move to the sides – you have to be gentle otherwise you risk peelage or breakage! DO NOT, I repeat DO NOT peel the polish off via the side of your nail on or near your free edge as you risk tearing off the tip of your nail (guilty as charged… multiple times). The longer you leave the glue base coat on under your polish, the harder it will be to remove – in my personal experience once the mani goes past the 5-6 day mark it becomes quite difficult to remove whereas a 1-3 day mani peels off easy as pie. A 2 week mani definitely requires the polish remover method as any other attempt to remove it will most likely result in damage to the nail and little flakes of the top layer of your nail being peeled off the nail surface. Can I create nail art using tape with a glue base? Short answer is no. Long answer is not for the first week or so as the act of pulling the tape off the nail will result in the whole layer of polish coming off. For me, this is the greatest disadvantage of the glue base coat method. Is it safe to put glue on my nails? This I cannot answer with certainty but for me, the “non-toxic” label is proof enough for me that it is okay to put on my nails. Is this the same as the peel-off base coats offered by nail polish companies? I am not sure of the exact ingredient differences but I believe that the core ingredient aka tacky or PVA glue is the same from what I have seen of various brands such as Etude House and Essence. That being said, indie polish maker Nail Pattern Boldness offers a peel-off base coat that does not use glue as its main ingredient so you may want to buy that if you don’t want to put glue on your nails. I have not personally used it but have heard good things about it. I’ve followed all your instructions but it is still not working for me! The effectiveness of a glue base coat may vary person to person due to differences in nail flexibility and what we subject our hands to regularly i.e. frequency of dish washing. I can only say what has worked for my (fairly stiff) nails. If you have had a different or similar experience to me using glue as a base coat feel free to comment below along with your nail type as it would make for some interesting statistics! I’d love to know your experiences with using a glue base coat so sound off in the comments below! Tags: diy, faq, glue base coat, peel-off base coat, pva glue base coat. Bookmark the permalink.